It is through this lens that I viewed the recent degree exhibition at the Galway-Mayo Institute of Technology, Galway. It became very clear that while there is an urgency in this institution to address the world around us it is done in a quiet, more introverted than one would expect during this current economic crisis. Alongside this there was a nod towards professionalism and the selling of oneself; we are familiar with every graduate having a business card these days – calling cards to an Irish society that repeatedly marginalises the arts. This was coupled with the artist’s statement – something I am thinking of collecting, the way one collects stamps or teapots. Some were promising the world and its mother, others were deliberately obtuse, creating a deflective wall around the work. The statement of Tina Hopp stood out as being playful, with an awareness of our text driven art world. Her statement was literally two-sided – one side of the paper was in academic speak, the other side in her own voice. The academic side laid claim to concepts and promised a concrete vision for the work while the personal side was full of questions that may never be answered. Hopp’s degree show is made up of fragile wire sculptures and other wires tracing lines across the space, the floor, walls and ceiling. This a juxtaposed with delicate paintings, again exploring line in space. 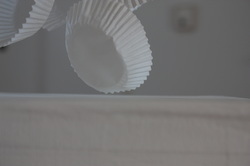 The installation is brought together by a sculpture in the middle of the room, made up of cupcake cases. These objects, made of the lights and translucent paper, defy gravity by making a precarious tower on a plinth. Through line, texture and abstraction Hopp invites us into a carefully planned world of enquiry. There is a sense of open-ended experimentation here as she invites us to consider the form of one line, then two, and so on until we accept this accumulative way of exploring the world around us. Hopp’s work is concerned with the internalisation of this world, how we negotiate and understand both real and imagined space. It celebrates the intertwining of intuition and intellect.